Today is Christ the King Sunday. That may not mean much to those of us who grew up in non-liturgical churches. 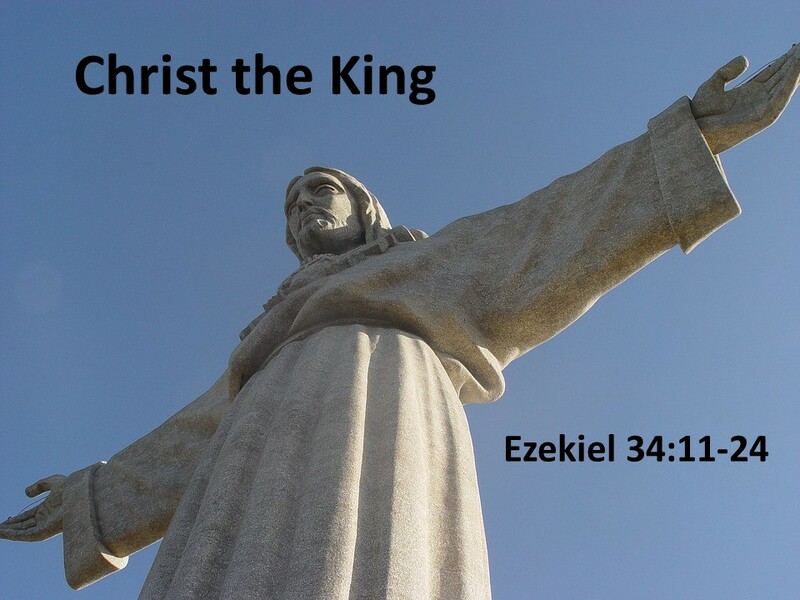 After all, Christ should be our king 365 days a year (366 days during leap years). You do believe that? Right? As a day on the church calendar, Christ the King is relatively new. It didn’t come about until the mid-1920s when Pope Pius XI introduced it. Furthermore, the day was first shunned by Protestants for being too sectarian. In time, however, many Protestant churches have adopted the day which falls on the last Sunday of the church’s year. Next week, with Advent, we’ll begin a new cycle in the church’s calendar. When the Christ the King date was introduced, Pius XI was concerned over the rise of Mussolini in Italy and atheistic Communism in Russia. Both were demanding the worship of the state. 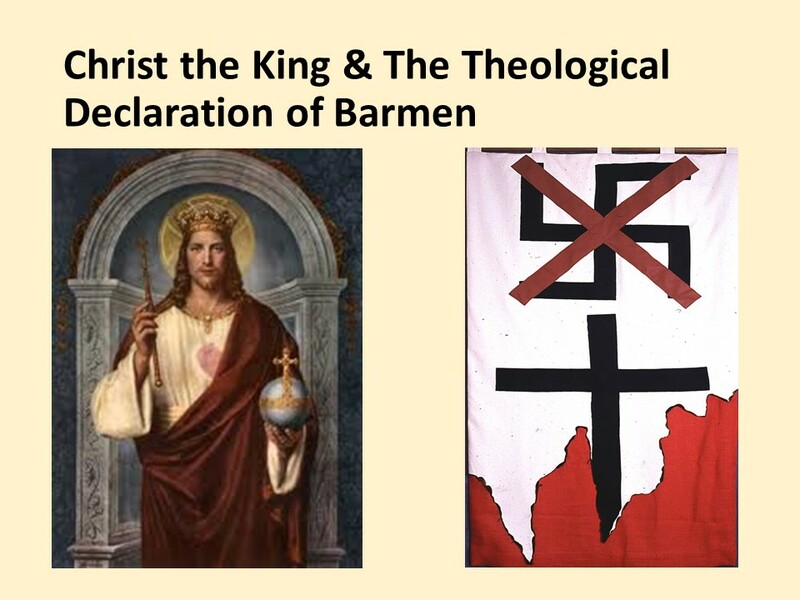 A few years later, a handful of Protestants would take a turn at standing up to the state when a group of Reformed and Lutheran Church leaders in German published the Theological Declaration of Barmen in 1933. We’ll read from this Declaration as we profess our faith this morning after the sermon. For Christians, Christ is Lord and demands our ultimate allegiance. 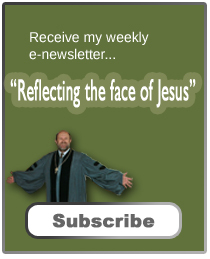 Now, proclaiming Christ as King isn’t a new concept. Christ is proclaimed as king in scripture and our Confessions lift up his kingly role as one of the three offices of Christ, the other two are the prophet and the priest. To show the importance of putting Christ first, let me share a story from the past. Hugh Latimer was the Bishop of Worcester in the 16th Century. As a Calvinist, he was a leader in the English Reformation. The King was Henry VIII, who (until he couldn’t obtain a divorce) was aligned with the Roman Catholic Church. One Sunday morning as Latimer was preparing to preach, he looked out and saw Henry sitting in the pews. “Latimer, be careful of what you say today. King Henry is here,” he heard whispered. 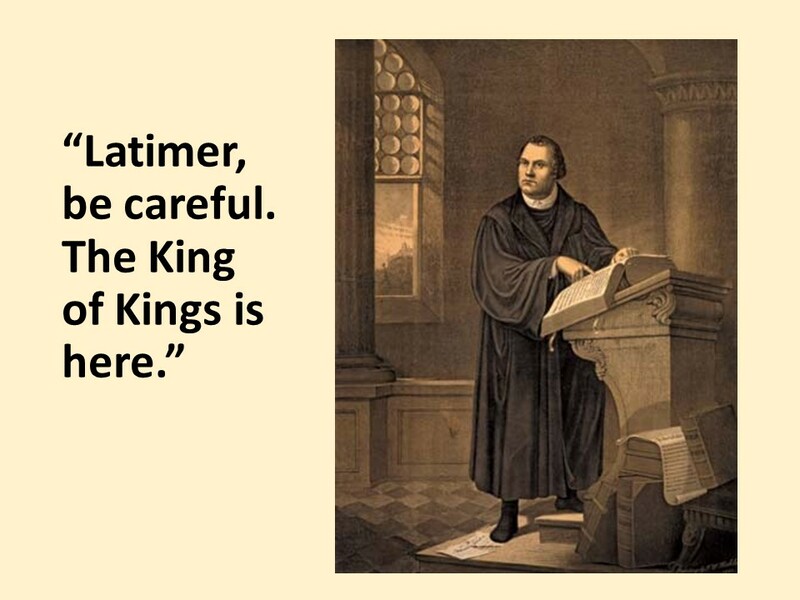 But then, as he prepared to enter the pulpit, he whispered, “Latimer, be careful of what you say today; the King of Kings is here.” Latimer would later suffer martyrdom at the hands of Mary 1, (also known as Bloody Mary). Today is a day to be reminded that we live out our lives in the presence of the true King, Jesus Christ. I expect the Israelites in exile felt the same. Where was their God when the Babylonians were storming the walls of Jerusalem? Some of the Israelites, I’m sure, lost their faith. But there were others listening and learning. 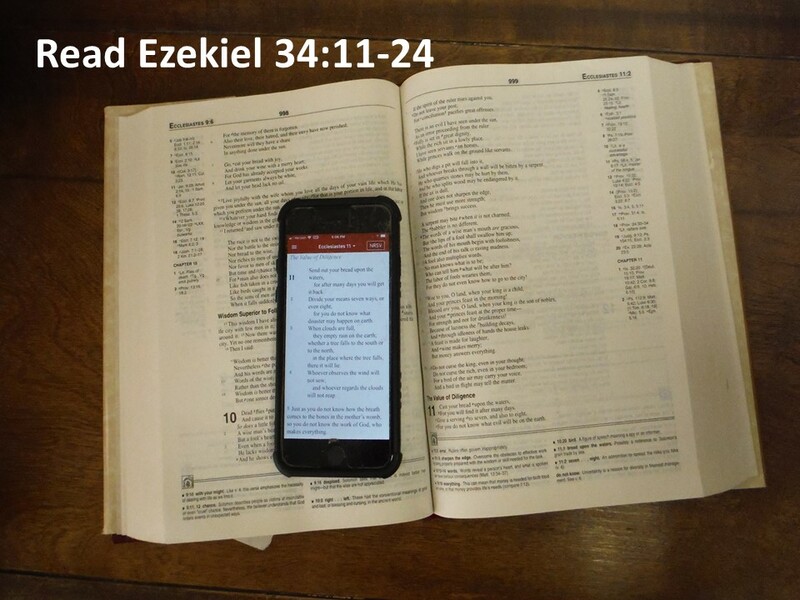 Ezekiel lifts up a promise: no longer will those in power lead; no longer will those who bully and abuse continue. Instead, God will lead as a shepherd. As a true shepherd God will protect Israel. This passage contains both judgment and promise! A perfect example of Ezekiel’s “bad shepherd king” would be the Czars of Russia. Not only did they ruthlessly exile those who challenged their position, they became the richest monarchs in Europe while ruling over the poorest country. 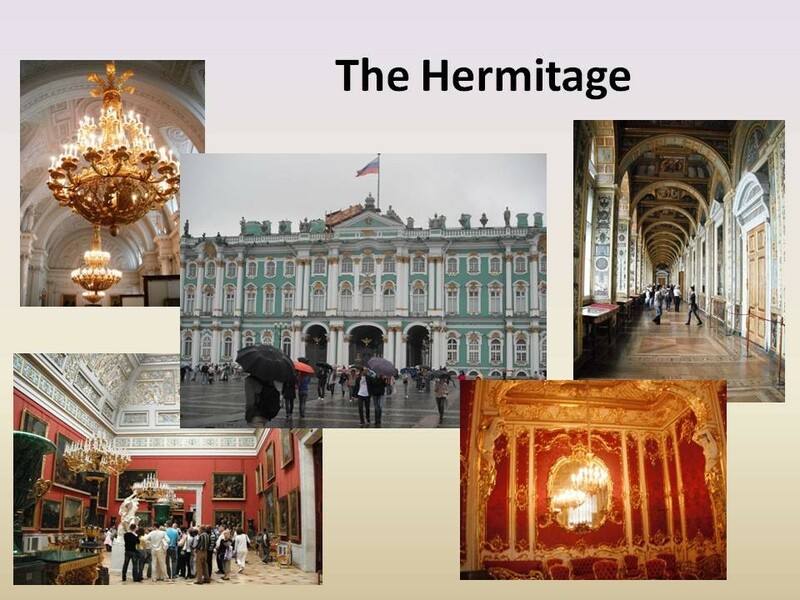 I know many of you have been to the Hermitage in Saint Petersburg, Russia. The place is incredible. It’d take a week to really appreciate all the art work that was collected by the Czars. It’s one of the world’s great art collections, but as I thought (and have also heard others say the same thing after visiting the Hermitage), it’s no wonder the people revolted. A good king is not one who lives high on the hog while his subjects starve. 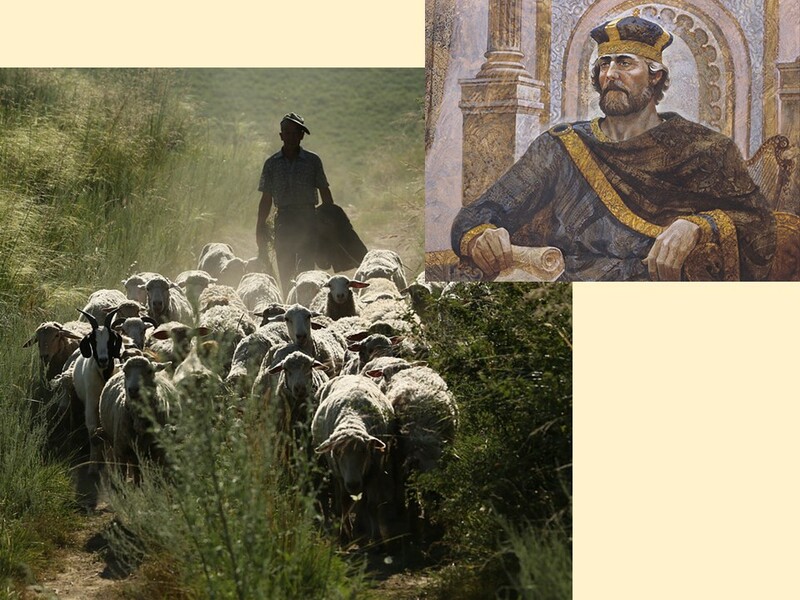 Rather a good king is like a shepherd, one who helps protect his subjects from danger and leads in a way that they’re provided with fresh fields (or food) and running streams (or clean water). A shepherd is an appropriate name for such a leader. Unfortunately, Israel didn’t have too many kings like this. Surely, there were some who did a better job than others, but most looked out for themselves and for their friends, allowing the abuse of their citizens. This chapter begins with a condemnation of such wicked rulers, the “shepherds who have eaten of the fat and clothed themselves with the wool of their flocks, yet have not fed the sheep. This is what God promises beginning in the 11th verse. 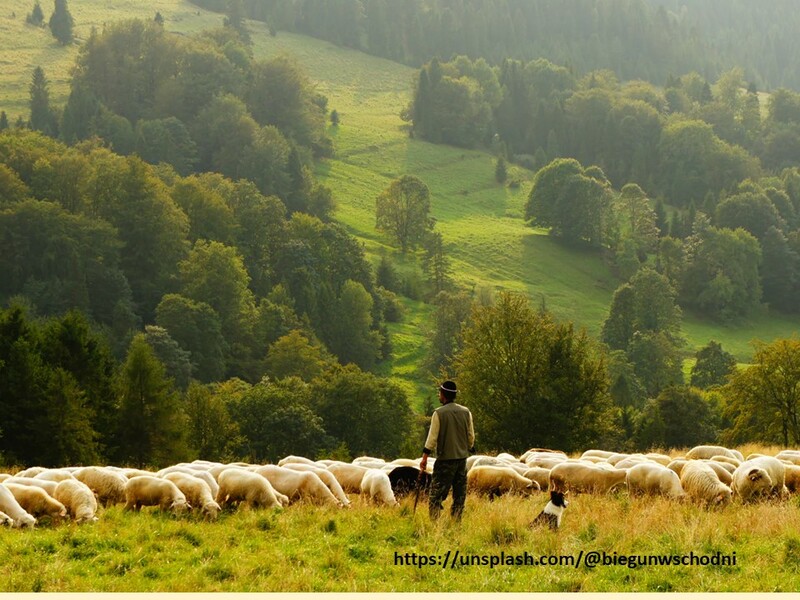 “I, myself,” God proclaims, “will search for my sheep.” God will be the shepherd. 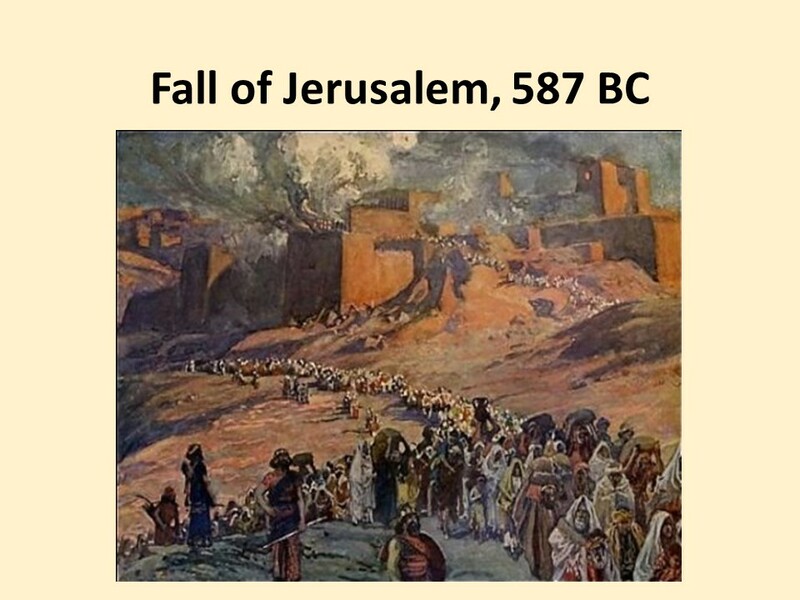 God will bring the people, who had been scattered at Jerusalem’s fall, back together. There will be a reversal of their misfortune. God will provide good pasture; God will strengthen the weak; God will heal the sick; God will bind the injured; God will seek the lost. By the beginning of the 16th verse, there seemed to be a balance between judgment and promise, but then there was a shift and God again speaks of judgment. “The fat and the strong I will destroy, says God. Notice the shift: no longer is God talking about the shepherds, or the rulers. God is now addressing “sheep and goats,” members of the flock. Obviously, it’s not just the leaders who are abusing their power, but there are some “sheep and goats” who are abusing others. Have you ever watched animals eat and notice how the weak are pushed aside by the strong? Sheep do the same thing. 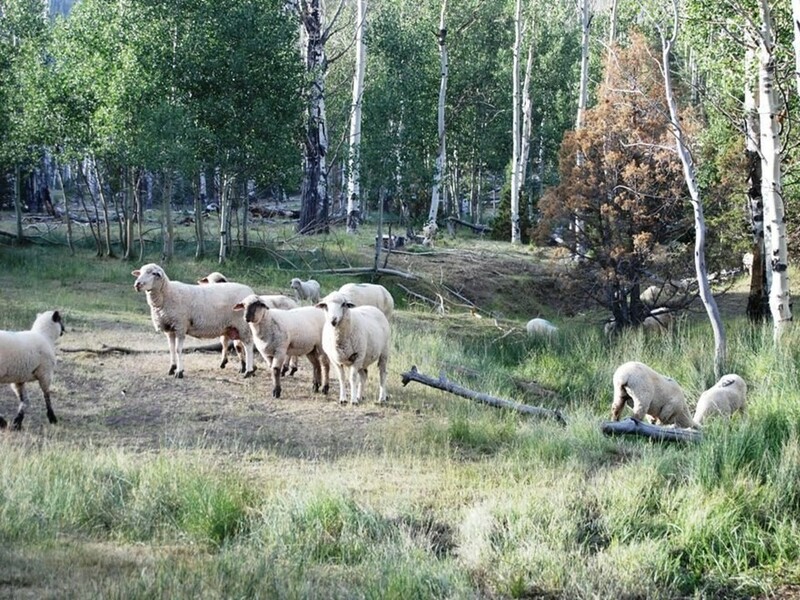 Sheepherders spend a lot of time with the weaker animals trying to strengthen them. If a ewe gives birth to more lambs that she can nurse, the ewe will push away the weakest lamb and the shepherd will have to take that lamb and find another ewe, another mother, for its nurse. The sheepherder has to encourage an “adoptive bond.” Otherwise, the lamb will die. Likewise, when the animals are being fed, the strong ones often push away the weaker ones. Without a shepherd, strong animals are able to take advantage of the weaker animals. And we see such behavior even among us humans. Without a good teacher, bullies in the classroom intimidate other students. Without good leaders, those with economic or political clout can take advantage and oppress those without. 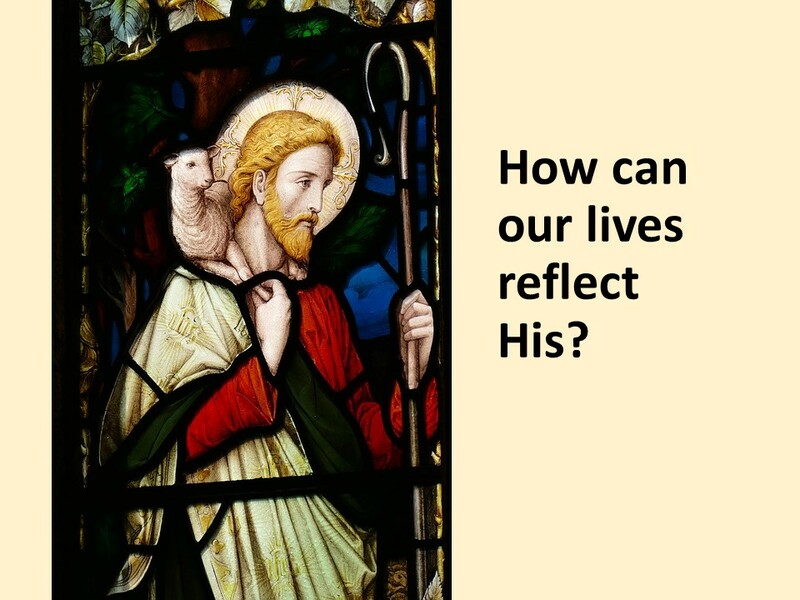 Now that God has judged both the shepherds who have ignored the needs of their flocks and the sheep who, in the absence of the shepherds, abused the weaker ones, God returns to the future promise of a new shepherd. God and his servant David will rule and guide the flock. David, the former shepherd who became a king, will return to be God’s prince. This is a Messianic Promise spoken to Hebrews living in exile hundreds of miles from their home. God will gather the faithful together and lead them back home, and a king like David will return and rule justly. There are a couple of things I want you to take from this passage. First, we’re reminded that there are bad shepherds and there are bad goats and sheep in the world. There are those who rule ruthlessly and those who use their power to exclude others. As followers of Jesus, we shouldn’t do that, nor do we owe such people any allegiance. Secondly, there will be a new day coming that will bring justice and hope. The bad shepherds and the bullies within the flocks will be brought to justice, as we heard in our New Testament reading from Matthew 25. We have no need to fear those who abuse, for our hope doesn’t rest in their hands, but in the hands of our loving Savior. Finally, as Christians, we’re longing for that day when Christ will return and his kingship will be visible for all to see. We’re to be lifting up this vision, reflecting the face of Jesus to the world. Parts of this sermon was taken from a sermon I preached on November 20, 2011. David I. Kertzer, The Pope and Mussolini (New York: Random House, 2014), 84. “The Westminster Larger Catechism” Questions 43-45. Robert F. Sims, “The Shepherd King,” in Under the Wings of the Almighty in “www.sermonsuite.com. Bill Watterson, Calvin and Hobbes (November 8, 1990). Margaret S. Odell, Ezekiel (Macon, GA: Smyth & Helwys, 2005), 432. When birthing lambs, a sheepherder will often smear the placenta from the lamb born of a ewe in order to entice her to accept a second lamb to nurse and feed. Thank you for this optimistic message. It is very needed in our world today. We seem to be in such turmoil and fear of dangerous consequences beyond our control. In your references to the shepherd and the ewe, I was reminded of one of my favorite episodes in the TV adaption of “All Creatures Great and Small”. During lambing time, the vet, Siegfried , found it necessary to find a ewe for a newborn that had been cast aside. A very sweet and heart warming film.